When you think of plants for dry areas, the first ideas that come to mind are desert plants like cactus, agave, aloe, and yucca. There are many other flowering perennial options, such as thistles like echinops (globe thistle) and eryngium (sea holly), and Mediterranean plants, such as lavender and Perovskia (Russian sage). Any plant with a tap root will be able to dig down deep and find water, so do not forget about beauties like asclepias (butterfly weed) and baptisia. Some gardeners can count on drought as summer's status quo, but even if you do not live in an area commonly thought of as having dry growing conditions, it is a smart idea to study up on which plants can adapt to dry areas. Sooner or later, every garden will experience a period of drought. While water is crucial to growing healthy plants, many perennial plants can withstand periodic dry spells, as long as they are given a chance to set down roots and become established before they are subjected to drought. This is the basis behind a concept called ​xeriscaping or water-wise gardening, where gardeners are encouraged to choose and group plants based on their water requirements and how much water will be available to them. Knowing what plants will thrive in dry areas will save you and your garden much grief when the rains refuse to come down. Designing your garden to withstand dry periods does not mean you cannot have a great deal of color and variety. Take a look at 10 perennials that may surprise you with their drought-tolerant constitutions. Agapanthus, the African Lily, is thought of as a moist-soil plant, but once established, they are tough enough to withstand dry spells without stressing. Agapanthus foliage grows in thick clumps of long, strappy leaves. The flowers are born atop leafless stalks about a foot high. They are round clusters of trumpet-shaped blossoms in white, purple, or blue that can last for up to eight weeks in ideal conditions. It blooms in early summer to fall in hardiness zones 8 to 10 in cooler climates. 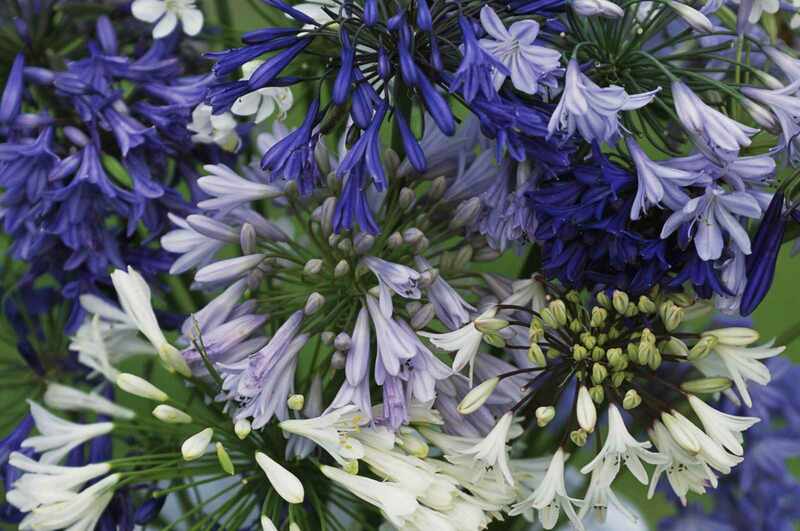 Agapanthus can be overwintered as houseplants or stored in a cold basement either in their pots or as a tender bulb. Gaillardia is a flashy daisy, too flashy for some gardeners, but also one of the most cheerful flowers you can plant. These flowers love well-drained soil, so drought means little to them. Keep them in full sun or they become floppy from being top heavy. The traditional Gaillardia is rust colored, rimmed with yellow. New varieties are being bred in as an assortment of yellows, rusts, and reds. Gaillardia Burgundy will appeal to gardeners who do not allow yellow or orange into their flower beds. Butterflies love it too. Heliopsis is one of those flowers that is so self-sufficient, it gets no respect. Even the common name, false sunflower, implies it is a poor relative of a more prized plant. This native of the dry prairie holds its golden flowers on stiff stems that can climb 3 to 6 feet. You can cut them back in the spring to create a bushier plant or just cut back the plant in the front of a large clump to extend the long blooming period even longer. There are single types that look rather like yellow daisies and fluffy doubles. Heliopsis is often confused with its sterile cousin, Helianthus, but Heliopsis is quite fertile and will happily spread. It blooms in mid-summer to fall in hardiness zones 3 through 9. Phlomis may sound like a disease, but it is actually an engaging plant with square stems, sage-like leaves and little balls of flowers atop each pair of leaves, all along the flower stalk. The flowers eventually turn into attractive seed capsules, prolonging this odd plant's interest. Jerusalem sage makes its biggest impact when massed. Flowers are usually yellow, pink or lavender. It blooms repeatedly throughout the summer in hardiness zones 5 through 9. The old-fashioned fringed flowers of Dianthus are also known as "pinks". It belongs to a huge genus and new varieties and colors are introduced every year. Although Dianthus often have pink-colored flowers, the name "Pinks" is actually descriptive of the fringed or pinked edges of the flowers. Along with pink, there are also Dianthus that flower in shades of whites, reds, peach, and similar varieties. Although often thought of as a spring bloomer, do not think of Dianthus as delicate. Dianthus is so tough, it is hard to kill. It blooms in the spring with repeat flowering, if it is cut back after blooming. It grows in hardiness zones 5 to 9. Platycodon gets upstaged by the somewhat similar looking bellflowers (Campanula). Campanulas do not burst open or tolerant dry spells as well as Platycodon. Platycodon has the bonus of being very low maintenance. It does not even like being divided. Kids love the way they puff up and pop open, but use caution showing a child how to press on the sides of flower buds to get them to pop open, or you will have a lot of squashed flowers.​ It blooms in summer and grows in zones 2 through 10. The Veronicas are a large and varied group. Choose your plants right, and there will always be a Veronica in bloom. They are also problem-free and tolerant of almost any type of weather. The flowers are long and spiky, like a salvia but more refined and with less course foliage. There are low growing Veronicas that make great edgers, Veronicas that clump and grow 2 to 3 feet tall and make excellent border plants, and some that will take over. Thankfully, it is the better-behaved Veronicas that are being sold these days. It blooms in midsummer to fall in zones 3 through 9. Thyme is such a versatile plant, that you should not confine it to the herb garden. Thyme is another of the Mediterranean herbs that simply thrives on dry heat. That is why it is so popular for growing between pavers. Thyme is rarely thought of like a flower, but most varieties do flower profusely and are quite lovely in lavender, white, pink, and even red. A happy planting of thyme will quickly spread and form a carpet. You can even walk on it. Just be careful of the bees it attracts while in bloom. It is in bloom from late spring to early summer and thrives in zones 3 through 9. Gaura flowers float on air and have names like Whirling Butterflies and Sparkle White. This is another dainty plant that can actually handle heat better than cold temperatures, although it does bloom more profusely with some watering. Even so, drought and poor soil will not deter it. The pink or white flowers are held high above the minimal foliage and keep forming and blooming all summer. Deadheading the entire spent flower stalk will revive it during prolonged dry spells. It blooms in late spring to fall in zones 6 through 9.